California is currently experiencing the third largest wildfire in the state’s history, spanning more than 267,500 acres. High winds of up to 50 mph and dry conditions have fueled the flames and blanketed neighborhoods in ash, forcing thousands across the state to evacuate from their homes. This fire has claimed more than 1,000 structures and threatened another 18,000 over the past several weeks. This fire comes at the tail end of an already above average year for wildfires and resulting structural damage. California has experienced 5 of the 20 most destructive fires in its history all during 2017, including wildfires throughout October, which resulted in 23 fatalities, with 245,000 acres burned and more than 8,700 structures destroyed. Insurance claims from those fires exceeded $9 billion. Compared to the 10-year average of 3.8 million acres, the US has experienced an above average 5.6 million acres burned from wildfires. For some states, like Nevada and Montana, which has already used the majority of its firefighting budget, this year has been the worst on record. Wildfires can occur anywhere; forests, grasslands or even just in a back yard. The causes are varied but often simple. Lightning is the most common natural cause, while humans account for the majority of other causes with campfires, cigarettes and outdoor burning. Wildfires can occur at any time, but most commonly during periods of little to no rainfall and high winds, which serve to spread the fire. When they do occur, they can burn through homes, businesses and structures very quickly. 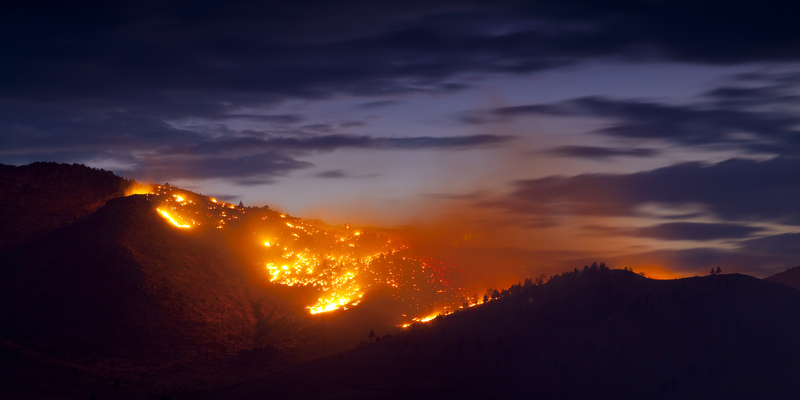 Embers from wildfires can travel more than a mile from the flames, potentially starting new fires where they land. As development expands and takes up previously unoccupied land, businesses are landing in or near areas where wildfires can occur. This trend is referred to as wildland urban interference, and it puts people and buildings in harm’s way. There are ways that you can prepare for fires like these. First, you can clear a 30′ area around your home of piled wood, leaves, brush and any other potentially flammable materials. Out to 100′ from your home or business, continue to reduce the occurrence of flammable materials, including landscaping. You can also add features to act as fuel breaks, like sidewalks and walkways that fire cannot ignite. It is also important to keep long garden hoses available that can fill garbage cans and other large containers with water in the event of an emergency. Of course, the best preparation to protect a structure is to choose the right material. A lot of people choose wood because it is often the cheapest option, but that choice does not consider the costs associated with the risks presented by wood. The flashpoint of wood is 572°F, while the melting point of steel is 2570°F. The average wildfire burns at 1,472°F with the hottest fires on record having reached 2,192°F. Wood structures are at high risk of catching fire and being destroyed, along with anything you choose to store inside of them. With that risk comes elevated insurance costs and constant stress and worry. On the other hand, steel buildings can withstand the heat and flames, and lower insurance costs as a result. In order to protect your buildings and their contents, it is important that you choose steel.